FAQ – Answers from the Electrician Squad! Question: Why do my Smoke Detectors keep beeping? When you discover that your smoke detector is beeping continuously, there is a high probability that the battery needs to be replaced. In order to ensure that you are operating in the highest standards of safety, your home’s smoke detector should be replaced annually. However, the smoke alarm beeps intermittently if the battery is low. The best route to deal with this is to get the battery replaced. Question: Is it okay for me to carry out electrical work? When it comes to addressing the question of doing your electrical work by yourself, there is no right answer to the question. The Electrical issue that needs to be addressed determines the ideal action to take. In the instance where you want to fix a tripped breaker or change a bulb, this can be easily done by any homeowner. However, it is dangerous to carry out electrical work that requires technical expertise. You must call an Electrician when you are not sure of the electrical problem in your property. This saves you the risk of electrical fire, personal injury or even death. 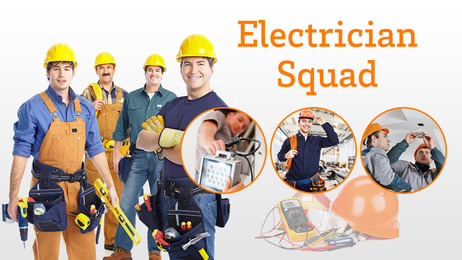 It is ideal to call an Electrician to diagnose and handle any electrical issue. It could save your life! Question: Why do the lights in my home flicker? Answer: When the lights in your home flicker, it can create a real challenge for you. This could point to a potentially dangerous electrical problem. The first step to take is to replace the bulb but if this does not work, quickly call an Electrician. One of the reasons why the light is flickering could be due to loose wiring. This can lead to an electrical fire if it is not addressed immediately. Question: How do I go about resetting my tripped breaker? – Find out where your Circuit breaker is located. The panel is usually found in your Garage, closet or basement. – Locate the tripped breaker. This is usually indicated by a breaker that is switched into an OFF position. The tripped breaker would not be aligned with other breakers. It usually displays an orange or red color. – You are to reset the breaker by flipping it OFF. Switch the Breaker ON. There would be a snapping noise or a clicking sound when it is in its proper position. Question: How do I resolve the issue with my Breaker? It keeps tripping. Answer: Once you realize that the Breaker trips over and again, quickly call the Electrician Squad. This may be as a result of too many devices or electrical appliances connected into the same circuit. The overload of electrical appliances can cause your breaker to trip. Conversely, this can be an indication that you have a major electrical problem on your hands. The Electrician Squad can help to diagnose the issue with the breaker and recommend a good plan that would fix this challenge.